The protest outside the Three store on London's Oxford Street. Animals rights activists have gathered outside the Three store on Oxford Street in London to protest against a PR stunt, which involves Three and ZTE giving out free rides in unicabs—"unicorn" drawn carriages—across the capital. 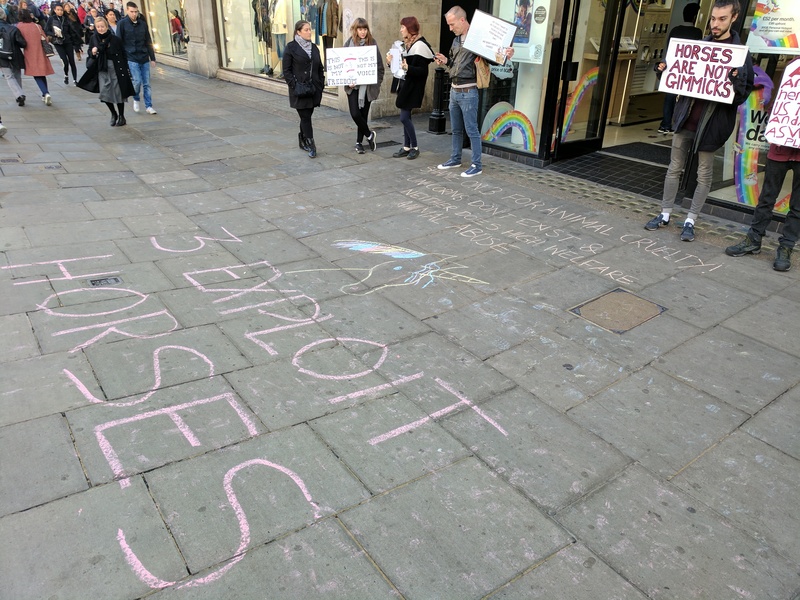 The protesters, which include members of the Surge and London Vegan Actions animal rights groups, claim that Three and ZTE have engaged in "high welfare animal abuse" by using horses in its PR stunt, which continues to run today at Monument, Southwark, and Canary Wharf stations. "Three the mobile network, along with the company ZTE, have been exploiting horses," said Ed Winters, a member of the Surge group. "They've been bringing them into the city, and dressing them up as unicorns and dragging them round the city. London is one of the most polluted cities in the world, and also one of the busiest." "There have been cases in New York and other places in America where horse drawn carriages have been involved in accidents that have ended up with horses being killed, and also caused injury to the public. It's not only a risk to the horses, but a risk to the general public too. If we're in a busy, central London location and something bad happens, it puts everybody at risk." Three and ZTE's Unicorn cab in action in central London. The gallery contains various other promo shots provided by Three and ZTE. Numerous accidents involving horse drawn carriages have been reported in New York, including several that have been caught on camera. A plan by New York mayor Bill de Blasio to crack down on the carriages collapsed in February of this year. Horse drawn carriages remain legal to operate on roads in central London, according to a Transport for London spokesperson, but they're not allowed to use cycle superhighways. In response to the protest, a Three spokesperson said: "We apologise if this activity has caused any offence to members of the public. Three and ZTE worked with Westway Carriage Horses Ltd and Equidivine to deliver this professional service to the public. The horses pull carriages carrying members of the public on a daily basis as part of their regular work. All products used to dress the horses are supplied by a specialist horse grooming company, Equidivine, and are 100 percent safe to use on animals." "We also worked with qualified vet Dr. Robert White-Adams to ensure that we provided the utmost safety and care of the horses. The horses work for less than four hours in total each day, were given regular breaks to rest, eat and drink, and their welfare is the priority for all involved."